September 7 was Flower Sunday at Wellesley College this year. 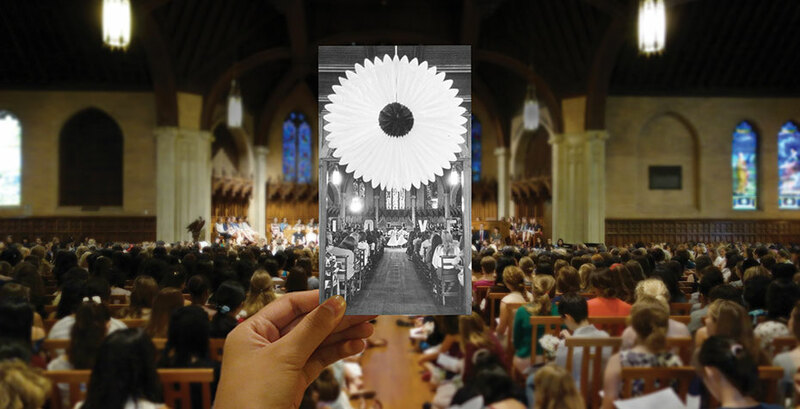 Flower Sunday is the longest-lived tradition at Wellesley, dating back to 1875 (though not called Flower Sunday until the following year). Each entering first-year student is paired with a student from an older class (a.k.a. "big") who helps the new student, affectionately called "little," acclimate and navigate the ins and outs of the College. Every year, on the first Sunday after the start of the academic year, big siblings bring flowers to their littles and accompany them to the flower-filled Houghton Chapel and Multifaith Center. There a wonderful multifaith program of music, dance, and words welcomes all into the Wellesley community. The theme this year at Flower Sunday was Exploring the Light. Many Flower Sunday traditions were continued with new aspects included for 2014. New faces were among the happy additions to the day, including Wellesley's new Interim Dean of Religious & Spiritual Life Annabel Beerel, who helped lead the afternoon's ceremonies, and Wellesley new Associate Dean of Students Carol Bate, who read verses from Rumi. President H. Kim Bottomly, Provost Andy Shennan, and Dean of Students Debra Demeis also gave readings; Wellesley College Chorus and Yanvalou performed; and chaplains of the Buddhist, Catholic, Hindu, Jewish, Muslim, and Protestant faiths added elements to the celebration.